What they do all day? As quality standards get stricter, demand is growing for environmental engineers to help sample, analyze and design treatment systems for air, water and soil. Companies trying to meet these tougher standards also are hiring environmental engineers as consultants. How to get the job? A bachelor's in environmental engineering is ideal, but related engineering degrees -- mechanical, chemical, civil -- are desirable too. Consulting firms tend to look for a master's in environmental engineering. What makes it great? At a time when so many are worried about climate change, the job is a hands-on way to help improve the environment, one Superfund site at a time. Environmental engineers may choose to tackle larger issues such as global warming or focus on cleaning up a local site or contamination. What's the catch? As engineering pay goes, it's not the highest. Industry and government rules can slow things down, which can be frustrating --K.A. 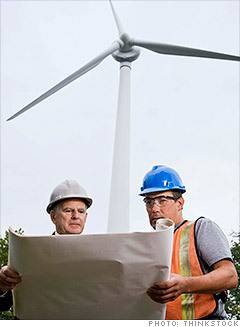 Do Environmental Engineers have great jobs, or what?